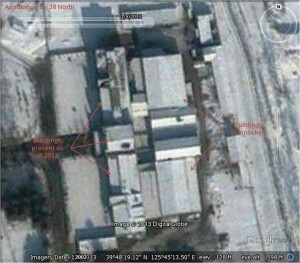 Commercial satellite imagery has identified facilities at the Yongbyon Nuclear Scientific Research Center that may produce fuel for North Korea’s recently restarted 5 MW plutonium production reactor and the Experimental Light Water Reactor (ELWR) still under construction. 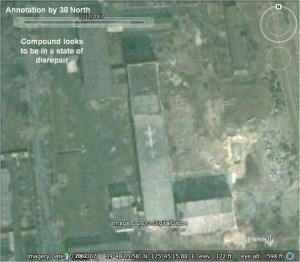 The identification of these facilities indicates a more wide-ranging, extensive effort by North Korea to modernize and restart the Yongbyon complex dating back to 2009 than previously understood. Imagery analysis indicates that a probable fuel fabrication plant for the 5 MW reactor is located in the old pilot fuel fabrication plant for that reactor which fell into disuse in the 1980s. Renovation of the main building in this complex began in 2009 and the facility has been operating since 2010. Imagery analysis has also identified a possible ELWR fuel assembly plant, built in 2013, north of the pilot fuel fabrication facility. One of the largest structures at Yongbyon, the building’s configuration—including a high bay area measuring 1,500 square meters—is suitable for the production of LWR fuel assemblies. Alternatively, it may serve as a heavy machine shop for the entire Yongbyon complex or for producing large components for light water reactors. If the building is intended to produce fuel assemblies, that process could take several years. As a result, the ELWR may not become operational until late 2015 or 2016. The 5 MW plutonium production graphite reactor first became operational in 1985, was shut down in 1994 as a result of a US-North Korean agreement, restarted in 2003 when that agreement collapsed, shutdown again four years later as a result of an agreement, and restarted again in mid-2013. The reactor has produced the plutonium used in North Korea’s nuclear arsenal and uses natural uranium clad in magnesium for its fuel. Pyongyang is building a 25-30 MW Experimental Light Water Reactor (ELWR) that is externally complete. Work probably continues inside the reactor building in preparation for a start-up trial period and then operation. According to North Korean officials, Pyongyang intends to build additional larger light water reactors in the future. Like other LWRs, the North Korean reactor will probably use low-enriched uranium fuel (LEU) bundled into fuel assemblies. The availability of fuel is a key factor in the North’s ability to operate these facilities. With regard to the 5 MW reactor, fuel rods for the facility were produced from 1983 until 1986 in a pilot fuel fabrication plant then shifted to a large new fabrication complex across the river and 3 kilometers south of the reactor. The fuel rod production building was subsequently converted in 2009-2010 to a uranium enrichment plant. In the case of the ELWR, which is now externally complete, a critical variable that will determine when the reactor will be ready to enter a start-up, testing phase is the availability of fuel assemblies. Moreover, the assemblies will have to be produced at a separate facility since it uses different fuel than the graphite moderated 5 MW reactor. Figure 1. Northern Yongbyon Nuclear Scientific Research Center. Figure 2. Southern Yongbyon Nuclear Scientific Research Center. The original pilot fuel fabrication plant, completed by the early 1980s, manufactured the first load of fuel rods used in the 5 MW reactor until a larger fabrication facility to the south was completed in the late 1980s. The main structure is a high bay building 90 meters long by 15 meters wide with a three-story 30 by16 meter building connected at its southern end. When viewed in 2007, the building appeared unused and in a state in disrepair (figure 3). Figure 3. The pilot fuel fabrication building in 2007. Image © 2007 GoogleEarth. Annotation by 38 North. While Pyongyang built two small, unidentified buildings at the site in mid-2008, work began at the main fabrication building in mid-2009 after a North Korean long-range rocket test in April resulted in UN sanctions. (Pyongyang then expelled international inspectors stationed at Yongbyon and conducted its second nuclear test in May.) During this period, the North began to replace the roof and initiated a general cleanup of the facility. 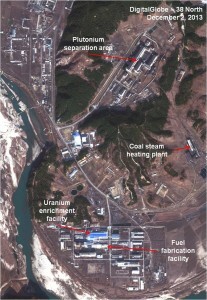 By November 2010, North Korea had converted the fuel fabrication building building where it had previously manufactured rods for the 5 MW reactor into a new uranium enrichment plant. Because the old fuel fabrication plant had been converted into a uranium enrichment facility, a new facility was needed to support the planned restart of the 5 MW reactor. It would have to produce fresh fuel rods in addition to the 2,000 already in Pyongyang’s inventory since that amount was less than 25 percent of the load needed for restart. The new facility would also have to be able to retool and clad the 12,000 fresh rods originally manufactured for the larger, never completed 50 MW reactor that were unsuitable for use in the smaller facility. Experts believed it would take a year with a reconstituted fuel fabrication plant to perform both tasks. Moreover, if Pyongyang planned to operate the reactor indefinitely, it would eventually need new fuel loads. The old pilot plant was the logical candidate for this operation, using equipment from the fuel fabrication facility. While it had been dormant for many years, the pilot facility had produced fuel rods for the 5 MW reactor in the past and had more than enough floor space to perform this mission in the future. Second, based on past operations it would be capable not only of producing fresh fuel rods, but also of retooling and cladding the fuel rods manufactured for the 50 MW reactor. Third, the facility’s location in proximity to the 5 MW reactor made it a logical candidate to perform this function. Finally, reactivating this facility made sense due to the lack of building space at the fuel fabrication area. 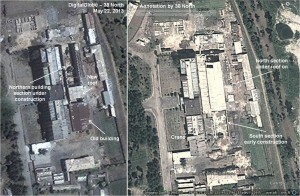 Commercial satellite imagery indicates that work began at two nearby unidentified buildings in mid-2008 and at the old pilot plant in 2009. A new roof was completed by August 2010. Moreover, images from mid-2010 through 2013 indicate that the building has been operating for over two years. The soot on the new roof shows that a heating process had occurred, such as the use of metal casting furnaces necessary to complete the heat treatment during the fuel rod assembly. The soot appears around a vent near the crown of the roof. 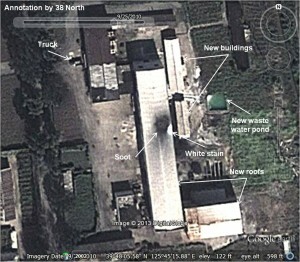 Another indication that the facility has been operating is the frequently present white stain on the roof, including in the most recent images of the facility. The spot, always centered on a small vent near the roof’s edge, may be the result of chemical vapors or gases being released. For example, the hydrofluoric acid used to produce the fuel rods is acidic enough to cause this bleaching effect. Figure 4. Renovated pilot fuel fabrication building. Image © 2010 GoogleEarth. Annotation by 38 North. Figure 5. White stain on roof of fuel fabrication facility. Reinforcing the conclusion that the building is operating are images of gray material in a probable dumping area nearby. The material appears to be coming out of a large door at the end of the pilot fuel fabrication building or the attached three-story structure. Starting in early 2012, the dumping area can be seen in a field adjacent to the three-story building at the southeast end of the pilot fuel fabrication building. By December 2013, a large amount of material has been deposited at the dump. The material may be ash created by furnaces inside the building. Pyongyang could be using the two furnaces removed from the fuel fabrication building for metal casting, namely to heat the rods, as part of the production process. If these furnaces use coal (and that seems likely since the North Koreans do not have natural gas and oil is in short supply), ash would be produced. Since the furnaces do not come in contact with rods, the ash probably would not be radioactive, allowing the North Koreans to dump it outside the structure. Moreover, this would be one explanation for the soot on the roof that could be the result of smoke from coal heating these furnaces. Alternatively, the dump may consist of construction debris from inside the building. Since the 5 MW reactor restarted in August 2013 and the majority of the fuel rods had to be produced starting in 2012, the DPRK could have been replacing the floor during the production of the rods. If the North Koreans initially started production of rods from already made cores, that would only require a fraction of the total floor space. Once production expanded to include new fuel rods, so would the amount of floor space used. Figure 6. Material seen at nearby dumping area. The discovery of the new fuel fabrication plant helps explain how Pyongyang was able to move rapidly to restart its 5 MW reactor. After announcing its intention to restart the facility in April 2013, the North began operations by late August. One caveat in previous analyses as to how quickly the North could restart the reactor was uncertainty about the availability of sufficient fresh fuel rods. Based on this analysis, it appears the North Koreans anticipated that future requirement before 2009 and knew the lead times required to produce the necessary fresh fuel. Once international inspectors were expelled in 2009, they moved forward with the renovation of the main pilot plant building as part of what was likely their contingency plan for reactivation. First identified in late 2010, Pyongyang has moved forward rapidly with the construction of its ELWR, now externally complete. Presumably, work is continuing on finishing the interior of the facility in preparation for entering a start-up period before the reactor becomes fully operational. Aside from the lack of information on the progress of work inside the reactor building, another important variable in determining when the reactor could be operational has been the availability of fuel assemblies to power the facility. Where such assemblies may be manufactured as well as the status of efforts to produce them remains unclear. 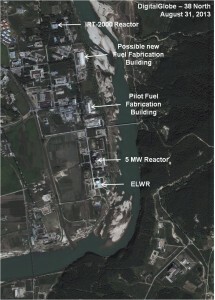 Imagery has identified a large, recently completed building at the Yongbyon complex that could possibly be used for production of ELWR fuel assemblies. Located north of the pilot fuel fabrication plant and alongside the river, construction began in March 2013 and progressed rapidly over 5-6 months. Initially, the old eastern building in the area was torn down and construction of wall footings for the new structure began. By mid-May, work was well underway. By mid-June the roof had been placed on that section of the building and construction was progressing on the southern section. By late August, the building was externally complete with other work still in progress in the area. External activity was completed by November. Figure 7. Buildings before new construction. Image © 2013 GoogleEarth/Digital Globe. Annotation by 38 North. Figure 8. Construction of possible ELWR fuel assembly building. Images © 2013 GoogleEarth/DigitalGlobe. Annotation by 38 North. Overall, the building is one of the largest structures in the Yongbyon complex. Imagery from May and June, before the roof was installed, indicates that the building is a high bay structure that measures 100 meters long and 30 meters wide, with interior rooms along the sides of the bay. The high bay area is 15 meters wide and runs the length of the building. The structure’s total floor space is about 3,000 square meters (32,000 square feet) and the high bay section measures some 1,500 square meters (16,000 square feet). The adjacent large three-story building—previously connected with the structures that had been demolished—is over 4,400 square meters (47,300 square feet) and may be lab and office space or serve some other function. Figure 9. Possible ELWR fuel assembly building. While the purpose of this new building remains unclear, one possibility is that it is for the production of fuel assemblies for the ELWR as well as for any additional light water reactors the DPRK may build in the future. Determining a new facility’s function is often easier if something is known about the purpose of structures it replaces. However, there is no available reporting on this group of buildings even though some date back to 1967. Unlike the pilot fuel fabrication complex, this area appears to have never been abandoned. Smaller structures were added to the complex in the early 2000s. By 2005 it appeared nearly the same as in early 2013, before construction of the new building began. The building’s overall size and configuration lends itself to the production of fuel assemblies. The rooms off the high bay area may house chemical as well as other manufacturing processes using machine presses and ovens. Typically, fuel pins are made on horizontal tables then clustered into assemblies with metal blocks at the top and bottom. Since the assemblies are very heavy, an overhead crane in the high bay area can lift them vertically if necessary, for example, for inspection after completion. In addition to the configuration of the building, there are other factors that may point to its use for ELWR fuel assemblies. First, the structure’s location may also be an important factor since it is located near the ELWR. 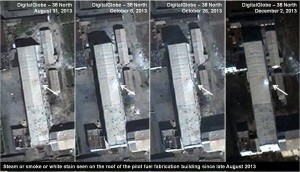 Second, there is no evidence of construction of another building at Yongbyon that might produce ELWR fuel assemblies, nor does there appear to be the necessary building space available for this purpose in the complex. (Locating this facility at Yongbyon makes sense since the right scientists and technicians, the nuclear, logistics and security infrastructure for such a facility, and the capability to handle spent fuel rods and process them are all located there.) Third, the new structure is also located in the vicinity of the new probable fuel fabrication building for the 5 MW reactor. While the two reactors use different fuel, the North Koreans are believed to prefer locating facilities that serve similar functions in the same areas. Alternatively, the large new high bay building is consistent with structures housing a heavy machine shop, including large welding, machining and heat treatment facilities. The high bay extending the entire length of the building would facilitate the use of an overhead crane for lifting and moving heavy components from one end to the other. 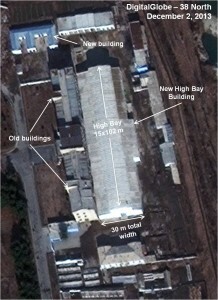 The building might be used to produce parts for the entire Yongbyon complex. Another possible role would be related to the processing of the spent ELWR fuel rods for their plutonium content. While there are no indications that the North Koreans plan to excavate a spent fuel pond either inside or outside the building, that option still remains. If the new structure is to be used for producing ELWR fuel assemblies, it may not become operational before the beginning of next year at the earliest. While the North Koreans have told visitors that the construction of an ELWR fuel assembly plant was proceeding in parallel with the new reactor, that does not appear to be the case. Given the state of the new building, estimates of when the ELWR might enter its initial start-up testing phase and then become operational should be revised since Pyongyang will require several years to produce the necessary fuel assemblies. As a result, the ELWR may not become operational until late 2015 or 2016. Since international inspectors were expelled form the Yongbyon complex in mid-2009, North Korea has embarked on a modernization program for its aging nuclear facilities. In November 2010, the North unveiled a new uranium enrichment plant. The construction of an Experimental Light Water Reactor, also revealed at the same time, is now externally complete. Also, after announcing its intention to restart its old 5 MW plutonium production reactor in April 2013, that project was completed by late summer. Now, the identification of a probable fuel fabrication plant for the 5 MW reactor as well as a large new building that may be related to the production of ELWR fuel assemblies reinforces the conclusion that this effort is more wide-ranging and extensive than previously understood. This analysis does not include North Korea’s small IRT research reactor provided to Pyongyang in the 1960s, which in the past has produced medical isotopes. The facility was intended to help gain experience to operate two larger reactors under construction that were never completed. 7 uranium conversion furnaces with bricks and mortar sand; 2 metal casting furnaces and vacuum system; 8 machining lathes; and approximately 5 tons of UO3 powder in bags. Normally, material that contains even a small amount of radioactive uranium would not be stored in the open.